I felt disappointed with myself for fibbing, and asked "What's that about?" 1. I was uncomfortable with the question and wanted to end the conversation. I was taught to never ask that, and squirmed under her inquiry. 2. I have said "yes", and then had near-strangers say, "Let me see!" I don't like removing and proffering the item. 3. I was working at this organization on a one-year contract. I had heard Kristin's manager make disparaging remarks about other contractors' clothing or accessories: "We paid for that" and "So that's what she does with her fee". I wanted to avoid the judgments that I imagined she would apply. I fou nd it odd that in that culture massive engagement rings were ardently admired, but a piece a woman might buy herself was subject to approbation. And no one asked if an engagement ring was real. Le Duc thought I was being condescending by withholding the information, but my actions were solely self-serving. I wanted to fly under the radar. I have changed. I now say, with a smile, "Real". I have a different vantage point at going on 62. I also no longer remove my jewelry for inspection. I enjoyed the support I received for this recently. "Becky", her manager "April" and I were taking a Starbucks break. Becky: Oh, I like your pearls, can I see them? Me: No, I don't want to take them off just now. Becky: But I want to play with them! April (to Becky): What are you, a cat? 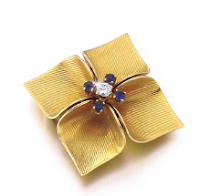 14k gold, diamond and sapphire pin, ca. 1940, 1 1/4 inches square, from Aaron Faber, $1,950. 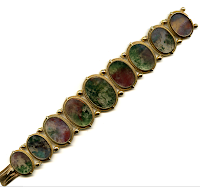 Antique yellow gold and oval shaped moss agate bracelet, ca. 1880 from Firestone and Parson; price on request. Vintage Cartier diamond-pattern 18k gold articulated bracelet, $3,499 from Dover Jewelry. I understand exactly how you feel. I have a few expensive pieces from Tiffany & Co. that my husband has gifted me with and one or two I bought for myself. The same goes for some expensive handbags from LV and scaarves from Hermes. I would rather not comment on where they came from because when I have a feel like I get raised eyebrows. I feel it's personal and I would never ask someone where they got something only comment that it's nice. On seeing that ring my instinctive reaction would be 'Oh isn't it beautiful'. Yes I would then love to have a closer look - but no, I wouldn't dream of asking you to remove it - just by holding your hand out anyone would be able to see it in all its beauty. I would hope that wouldn't be offensive, although unless you were a close friend I doubt it I would ask, just hope you would offer a closer look. To ask if it's real though - that is just so rude and really what difference does it make, it isn't going to make it any more or less gorgeous. You shouldn't feel uncomfortable about your response because your options for a polite reply were limited. Duchesse, I so look forward to seeing a jewelry post from you pop up in my feeder, as I know it will be a visual treat and thought provoking. I don't have very much "real" jewelry (yet) but did enjoy a family friend's reaction when I told her that my "diamond" studs that she'd been oohing and aahing over were really from Talbots! At work, I try to keep under the radar with any expensive accessories in general. "What are you, a cat?" Love it!!! Lulu: If asked, I will say where they came from, but it can be an intrusive question, depends on tone and relationship. Pseu: Thank you! Could post every day on jewelry! The person who wanted to see the pearls brought it up again last week, "Remember when I wanted to play with your necklace and you wouldn't take it off?" I said, "Yes, it is very delicate." If someone asked me to take off my jewelry so they could see it better, I'd reply with a straight face, "Sorry, but my insurance company doesn't permit that." The rudest thing going on in your story was the behavior of your colleague's managers. Tsk tsk. I have seen her recoil in fear and disgust when this has happened in public and by complete strangers! Thank you, love the vintage gems....I have a few myself, better quality for the money and l love the designs. I can't believe that people are so rude. Luckily no one has ever asked me if anything I wear is real. I wouldn't take my pearls off and hand them to someone to play with. I'm amazed. What kind of crazy people ask you to take jewelry off?! I can't imagine anyone asking me this. Perhaps I don't invite it? When I first got engaged, I remember removing my engagement ring for a friend who was just about to get engaged herself. I knew she was eager to see how she'd "feel" with an engagement ring. Okay that's not entirely true. My daughter loves to try on my jewelry when I take it off at the end of the day. She is allowed to look at herself in a mirror with my jewelry. But I consider that a special case. Oh, another fabulous jewelry post. I too adore your jewelry posts, and, inspired by you, have been consolidating and working towards those things that I really want and love. I've been inclined to take the same path, playing down that something is real, because the question or questioner does not seem friendly, but I do it less recently. People can be so rude, and it seems amazing to me that the young woman who wanted to play with your pearls asked again. For shame. "April (to Becky): What are you, a cat?" Voila! I have now declared this line to be a true internet classic. I almost lost my coffee down my blouse when I read that. My answer to people who ask if if something I am wearing is 'real' is to reply, "Why? Does it matter? I wear it because I like it." I can never get over how RUDE people can be! (And if you point that out,in the moment, then you are rude too. Bummer.) I can't even imagine what I'd do if someone reached out and grabbed a necklace I was wearing. I just love gorgeous jewelry and I'm so grateful that there are people out there who can afford it and sport it daily so that I may benefit from it too. It's so sad when fab pieces languish in the safety deposit box, unseen, unworn and unappreciated. I have no jewelry that might elicit such enquiries, but years ago, a visiting "friend" asked how much I'd paid for my recently-acquired grand piano. When I responded that I'd rather not say, she pushed and prodded, refusing to let go and demanding to know why I didn't want to tell her. Although I taught piano, making it a business expense as well as a beloved instrument, I felt uncomfortable about the gap her curiosity and possible envy opened, and very annoyed at her for forcing my rebuff. Everything I've ever bought I've worked and/or saved for, yet I see no reason why I should explain myself. That conviction has strengthened over the years as has my amazement at other people's rudeness! Thank you for a fine post! I think that the people who ask questions like the ones you wrote about, are plain stupid. And in my opinion, I think that it is just a waste of time to even give an answer. Those who know something about jewelry, won´t ask such questions. My MIL always asks first: Is that new? How much did it cost. I hate this kind of questions and try to change the conversation to something else. always asks first: Is that new? How much did it cost. Argh. A close friend of my MIL's *always* does this too, and it makes me nuts. I now make sure not to wear anything new or that could be perceived as expensive around her, because she just will NOT let it drop even if I'm being politely evasive. Anonymous @ 10:54: I read it as quite transparent envy. hostess: It IS scary when you have never seen the person before. And oh I would love to see those pearls. LPC: And these are Canadians, who have an image of moderation and reserve- LOL! spacegeek: Um, women in a large financial services corporation. Typically done over lunch or (I admit) drinks after work: "Oh I love your bracelet, let me see it." Toby: When I asked "Does it matter?" a 30ish woman said, "Well yes- I want to know if I can spot the real thing" and I said, "Honey, when you're over 50, it's REAL." I am rather infamous for that remark. mardel: Thanks for your encouragement. I'd love to know what you do choose! Anon@1:06: Yes, we are not supposed to be rude back... perhaps one could just say "Oh my!" as if presented with a piece of decaying liver? I sometimes avoid questions by saying, "I don't know, it was a gift." But I'm tired of evasions. materfamilias: I not only think you should not have to explain yourself (or give price), you don't owe anyone an explanation *period*. I would love to see your impish grin, I'd be tempted to say, "Stole it!" metscan: Ah, the MIL! That adds an extra layer of discomfort. Pseu: Let's work out some outrageous answers, you will carry one of your killer bags, try them out, then report back. Q: Where did you get that? Pseu: George Clooney wanted to thank me for a sensational weekend. Q: How much did that cost? Pseu: You know, I can't remember, the store served us tequila shooters. Pseu: I have hypnotized myself to forget. Before today I had never heard of anyone asking someone to take jewelry off to see it! My reaction too, WHO does this?? Though it makes a good story. The art of the inspired retort gets cultivated, I suppose, in response to such rudeness! judy: I have mostly been asked "can I see it" in offices where the people are colleagues (but not friends), but have also had my hand grabbed or necklace touched by complete strangers in places like fruit markets, elevators and gyms. And at a prestige jeweler, the saleswoman asked if she could clean my ring, then placed it on her finger and admired it for a good minute before handing it back to me. This is timely because one of my best friends just got engaged, and this afternoon we met for coffee so that I could see her ring. It is so beautiful, and I was so happy when she slipped it off and handed it to me. I wouldn't have asked, and I certainly didn't try it on, but I was really able to get a good look at it and I loved holding it so that I could move it and see the stones sparkle. Beautiful jewelry is such a joy. I do think it should be shared with the world, but of course on your own terms. I almost never remove my ring for anyone, and fortunately I'm rarely asked to. rb: Awhile ago I handed a ring to a friend to try, and she realized that what she thought would suit her, did not. So for education or admiration, it's fine between friends, if that's their wish. Great post and hysterical comments! I too would like to know when if became the norm to ask someone if their jewelry was real. That is so uncouth. Also, for someone to expect that you would take off a piece of jewelry and hand it over for inspection is beyond belief. OK, this is acceptable for very close friends but certainly not for co-workers. Metscan's comment hit close to home. My MIL, who was mega weathly, used to always ask me if this thing or that thing was new. It was her way of keeping tabs on my spending. I learned to always say "Oh no, I've had this for ages". What is it with other people anyway needing to know when and where you bought something, and how much it cost. And the George Clooney comment is just classic. Belle: I know women who use "had it for ages" with partners, too! One time at a supermarket in FL, a kind of Suzanne Sommers looking woman said, "Oh can I see that ring?" and I held out my hand. She then said, "Anything on the other hand? "; I said "Just my wedding ring." She then eyed Le Duc with admiration and said, "You keep that one on there". I was floored, and so was he. I think people who ask to try on your jewellery or how much it cost don't have any clue that they're being rude. Many of them probably truly believe that they are showing interest in you and your life and being flattering. I'm not saying it's right or that you're wrong to feel uncomfortable about their requests/questions; I just truly believe they have a completely different perspective. Others don't care. As the parent of two young adults, I have witnessed the "If I want to do it, I will" attitude, sometimes under my own roof. I let others look at my jewellery, but only on me. I love that "what are you a cat" retort! Just found your blog and love it. My snappy answer to the question of, "Is it real" is "Well, it's not imaginary". Anonymous: Welcome, that's one I can use.